Nurse Mates newest compression trouser socks in fun stripes! Graduated compression increases circulation and helps to relieve the leg strain and swelling that many active professionals experience. 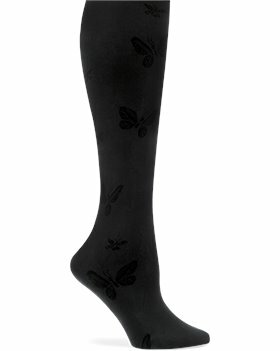 Very comfortable trouser socks with a soothing feel to the touch. Will definitely recommend. Used them for years. Good for your legs. Feel great and hold up very well. I am a nurse and will always use them instead of trouser socks. very well made and very comfortable. These are a great fit. They are light weight but still have some compression. I will purchase again. Product runs a little big. These support hose are Soo ? ?Comfortable, and I even had bought some for my niece and She loved them! I bought the compression trouser socks. I received several pair, not only do they keep my ankles from swelling while working, (I am a nurse), they come in an abundance of fashionable colors. I love them! I have received several compliments from my co workers. I would highly recommend these to anyone who wants comfort and fashion. GREAT PRODUCT. MAKES A BIG DIFFERENCE WHEN YOU ARE ON YOUR FEET FOR 12HRS . love the sox, the price and the service! will def order again. Using for pregnancy leg cramps. I see an improvement and they wash well. Good wear sock when work on feet more than 8-12 hours.